The poet Francisco de Icaza famously said ”..there is nothing in life so sad as to be blind in Granada”, and boy was he right. Granada, or the Emirate of Granada as it was known while under almost 800 years of Muslim and Moorish rule is without doubt one of the most beautiful places in Europe, if not the world. Yet, for some reason, when you mention it to Irish people very few have actually been there. Over the next few points I will make an attempt to pull you away from those Costa del whatevers and journey just one hour north of Malaga airport for a cultural treat. So let’s get cracking here’s what lies in wait for you. Granada was the sparkling gem of a great Islamic empire that conquered practically all of Spain known as Al-Andalus, where today’s southern province of Andalusía gets its name. As a result of its past, there is a fantastic east meets west feel to this place, culturally and architecturally. Granada was under Muslim rule from 711 to 1492 until King Fernando and Queen Isabel united their Catholic kingdoms of Aragon and Castille to conquer this last remaining Muslim stronghold. However, the fossils still remain. Small windy streets and cluttered arabesque market places will remind you of a scene from Aladdin and are typical of inland Southern Spain. These streets serve as a respectful nod and reminder to the city’s past. This is an utterly enchanting setting and certainly a strong reason to visit Granada. These streets climb and wind their way up the hills and lead like a maze to the beautiful ”plaza de San Nicolás” hilltop square. Which brings us to our second point. 2. La plaza de San Nicolás. Once you have trekked your way to the summit of Granada’s old town you will arrive at this natural balcony square. 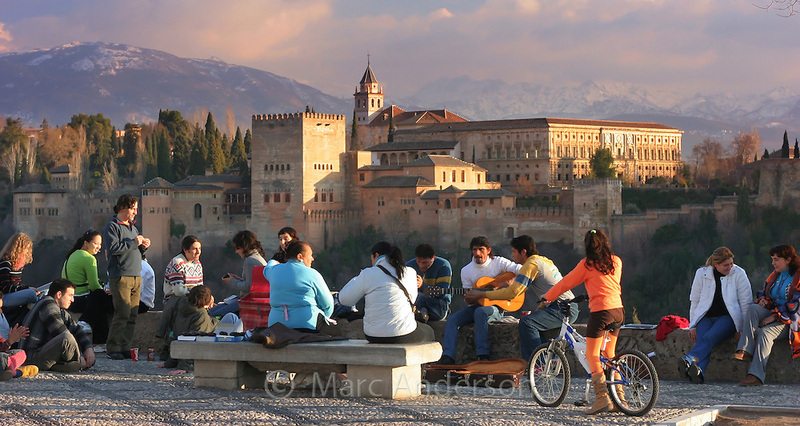 From here you will overlook all of Granada’s splendor and as if the scenery wasn’t enough, the square is also world renowned for traditional guitar playing and singing. Famous Spanish and flamenco songs like ”Bamboleo Bamboleaaa…” can be heard echoing from the square all day. This is a trendy, vibrant and dare I say very cool place. The perfect spot to hang out and watch the sunset over the beautiful La Alhambra Moorish Palace. It is free entry to the Plaza and very enriching to do so. 3. La Alhambra and Generalife Gardens. This was home to the Nazari moorish rules of Granada. The spectacular palace stands proudly in Granada at the foothills of Sierra Nevada. The Alhambra is an awe worthy giant that defines the city and gives it an almost whimsical feel. The palace is a must visit for anyone in the area. First built by the Arabic rulers and later extended and added to by the Catholic kings, today it is toured all year round by people from all around the world. However, I wouldn’t recommend going midday in summer time like we did, as temperatures can sore to 40 degrees celsius! One funny observation while I was there was the large numbers of Asians using black umbrella’s to keep the sun off them… Initially I laughed: later I looked on with envy as the Granada sun sizzled us! I could go on and on about the unique marriage of the Catholic & Arabic scripture designs of this palace and how the Generalife garden was built to represent the muslim impression of heaven. However, that would take up the whole article. I’ll simply say, If you’re in Granada, go to La Alhambra ! This place is 100% up there with the Eiffel Tower, The Colosseum or anything else Europe has to offer. You will not be disappointed! Secondly, Conventional holiday stuff is important too! 1. Granada is a City for all Seasons. Amazingly, Granada offers both sun and ski holidays depending on the time of year! Yes! Believe it or not you can fly into Malaga with the intention of going on a skiing holiday! 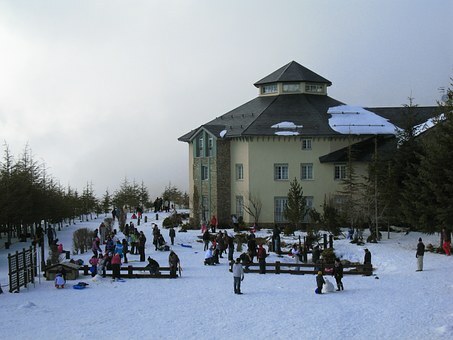 Resorts in Sierra Nevada cater from November until as late as March ! Granada is in fact home to Spain’s biggest and Europe’s most southerly ski resort! Crazy, I know, and we think we have varied weather here in Ireland! Don’t worry, the summer months still offer that typical espanol heat for all you sun worshippers. Be careful though, as I said, that sun can get cooking and you might only realize it when it’s too late! Stay hydrated, stay out of the sun during peak times and maybe even sneak in a little siesta 😉 . Personally, I’d recommend going for dinner in the evening time to one of the many outdoor hillside restaurants and watching the moon rise over an illuminated La Alhambra while the spanish air begins to cool. Also, well-connected, tranquil beach resorts such as Almunecar, Motril and Salobrena are less than 1 hour away. 2. And yes, of course they have an Irish Pub! If you’re missing your home comforts, have no fear. Granada has it’s very own authentic, Irish run pub. Hannigan & sons is situated in the heart of Granada and for me it was like stepping right back into the Emerald Isle. This is a possible solution for a homesick traveler. The pub offers weekly karaoke, table quizzes and even language exchanges for the more adventurous. But if you’re all Spanished out, just sit back in the surroundings of home and enjoy the craic with a pint of plain. This entry was posted in English, travel and tagged granada, holidays, irish pub, travel, wanderlust. Bookmark the permalink.